I was looking for a good bass to lay down some decent disco grooves with. This is perfect. A 1962 reissue would have been fine too, but I didn’t see one I liked used. This PB57 sounds EXACTLY what I was looking for with that finger “pop” sound when playing octaves. I’m old school and this thing takes me back to 78. I’m so excited to mix this with my synth sounds. I think it should sound nice in the mix. Here is a quick video where I recorded the Bass into the Boss RC-300 over a drum groove. I need to work on the bass sound recording a bit perhaps, but it at least give you the idea of what I’m aiming for. I also used a pick with this particular bass line, but often use my fingers or slap. I used to play bass a while back in the late 90’s. Sometimes it’s just easier to come up with a groove on the bass rather than the bass synth. It’s also fun to mix the too of course. Note that I’m not claiming that a Fender 57 reissue P-Bass is the choice for Disco bass lines, rather it gets me awfully close to the sound I grew up listening to in the late 70’s and early 80’s. 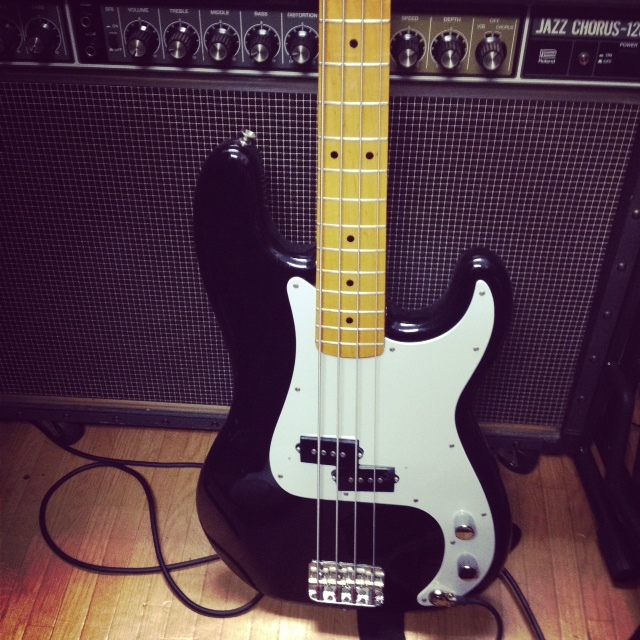 I think most will agree that some sort of Precision Bass is good for that old school Disco octave vibe. Although, I know other basses will get you that sound too, plus the fact that DI/Amps, compression, and other things are important too. This thing is amazing. Only in JAPAN! I bought this used with three cartridges, the YK-20 keyboard, the SFG-05 FM Sound Synthesizer Module, plus all of the original boxes, cabling, and manuals. Everything was in MINT shape too. It works great with my PC monitor and I have a Roland MSX mouse that I use with my Roland S-50. The only thing missing is the Floppy Drive and I’m currently researching ways around that. Sounds GREAT too! It’s kind of fun and nostalgic from 1984. I’ll add more info once I start working with it. Here is the list of items I acquired for $60 bucks! 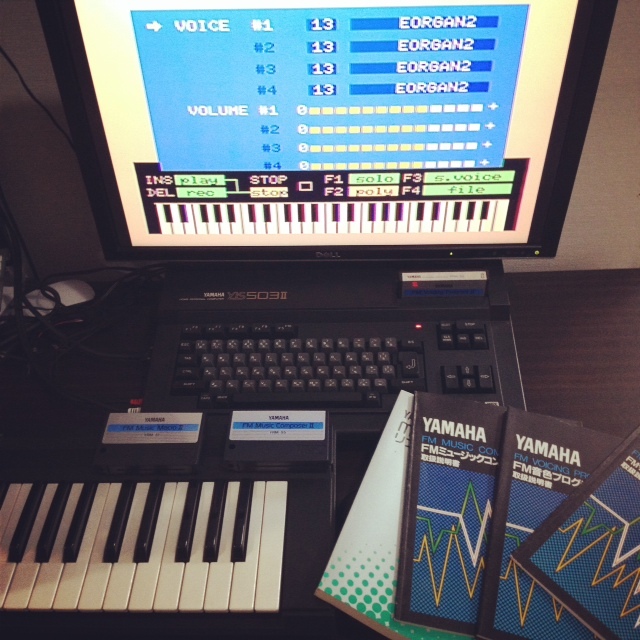 1 Yamaha Music Keyboard YK-20 with Box. Everything was in mint shape. I started it up today with my PC monitor via an composite cabling and it worked fantastic. I also checked the sound it was very good. I’m excited about learning more about this old 1984 music making system. I’ve really come to enjoy the Korg Polysix Synthesizer. It’s such a joy to use each day and the attention it requires is amazing. I’m not sure why, but if I let the Polysix sit without playing it for more than a couple of days, strange things seem to happen inside the machine. It’s funny, I don’t even keep the cover screwed down anymore because I’m constantly lifting up the hood and cleaning something. The Polysix kind of reminds me of the daily repairs on my old VW Bug during my University days. That actually was a very trusty vehicle probably because I knew it inside and out. I feel the same with the Korg Polysix. I sometimes see double with the LEDS on the front panel. Occasionally a key triggers a few times too many, but sometimes it sounds kind of cool. Everyone so often, I also get a glitch or two which seems to be triggered by what I don’t know…laugh. What’s interesting is that if I lift the hood and rub some alcohol cleaner around the circuits ( With the Polysix unplugged of course ), it then fires up on all cylinders just fine. It’s probably the cleanest Polysix I know of. I have another Polysix to the right which actually works perfectly yet, I keep migrating to this particular one which is older in serial number. For some reason it just seems to have quite a bit of character. I know a lot of people who get those KIWI mods, but I’m not quite ready to spend more than what I paid for this Polysix for the upgrade. The Korg Polysix sends me into madness sometimes but it can also transport me into another realm of sweet music and fun. I just love the modulation you can get out of the Polysix. I think the video posted above illustrates pretty well the effort in trying to tame the mighty machine and keep it running. I feel extremely fortunate to not just have one, but two Korg Polysix synthesizers. However, the one in this video is special to me. I don’t know if I’ll ever sell it primarily because I have this strange feeling it won’t ever work again the minute somebody else turns it on. Yeah, I’ve had a lot of cars in my life and they’ve gotten nicer since my VW bug days. Yet, it’s that VW bug that I remember the most. The bond we had working together to get back home safely in the wee hours of the morning after a night at the club was amazing. The bug always came through for me just like this trusty, but mad, old Korg Polysix. Cherish those struggles in life I say, as they are the very things that define us. Have a great weekend and happy jamming! Note about the video: All tracks were looped with the Boss RC-300. 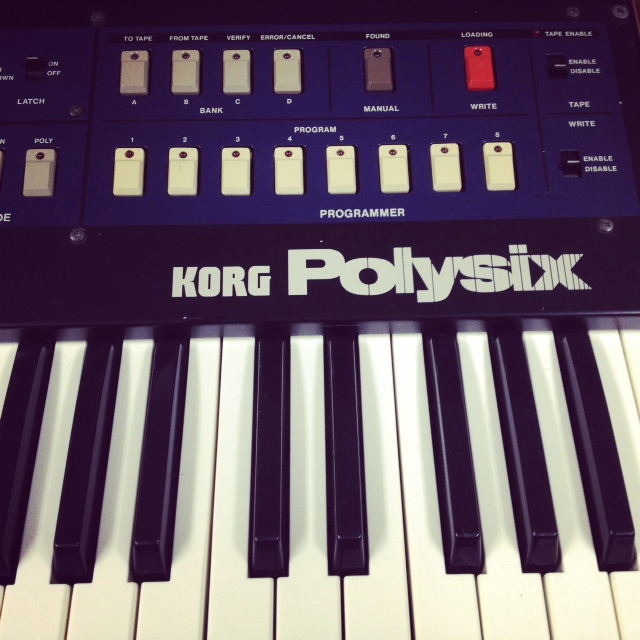 I toggle between several patches on the Korg Polysix itself. I use a drum machine for the drum midi’d to the Boss RC-300. Today I picked up the new Roland AIRA System-1 Synthesizer from my local Shimamura Music store here in Nagano-city, Japan. As everyone knows it’s a highly anticipated synth release and likely will be quite popular initially. I also have the TR-8, TB-3, and VT-3 which I’ve enjoyed very much. Thus I had every expectation that the Roland AIRA System-1 would deliver. Please note that for the sake of this review, I’m not a huge EDM music fan, rather, I’m into the vintage analog 80’s sound being that I graduated from High School in 1986. I’m also VERY fortunate to have a sizable analog synth collection that includes the Roland SH-101, Juno, and JX series synths. I make this point to help everyone understand my initial impressions of the System-1. Also, I did NOT try out the System-1 in the store. I didn’t have time and I there was a waiting list to purchase it. This was a pre-order so I just walked out the door with it, but I knew I’d probably be keeping it regardless. When I first turned on the Roland System-1 I actually was quite disappointed. I thought the presets where horrible and worse than most any other synth I had heard or even owned. The System-1 did not sound analog at all , rather in fact it sounded VERY digital in a nasty sort of way. So, I decided to put the System-1 in manual mode and create my own patches. That’s when things settled down a bit and I realized there was going to be light at the end of the tunnel. I should say that I felt the presets were mostly EDM “Electronic Dance Music” oriented and I mean 2014 EDM oriented and not the stuff I am accustomed to from the early 80’s on up. I expected EDM of course, but not that much and definitely not bad sounding. That’s subjective though and just my opinion, so if EDM is what you want than the System-1 “initially” may sound good to you. That’s ok! I also found that when creating patches I got closer to the sounds I wanted by simply working with one OSC first and turning off OSC 2. For those that don’t program synths very often, this can be a good way to start out. Keep it simple and just work with one OSC and then later bring in OSC 2 when you know what you want or when you feel like experimenting more. Otherwise, you might find yourself frustrated and not getting at least the basic sounds you desire. The LFO section is SUPERB! 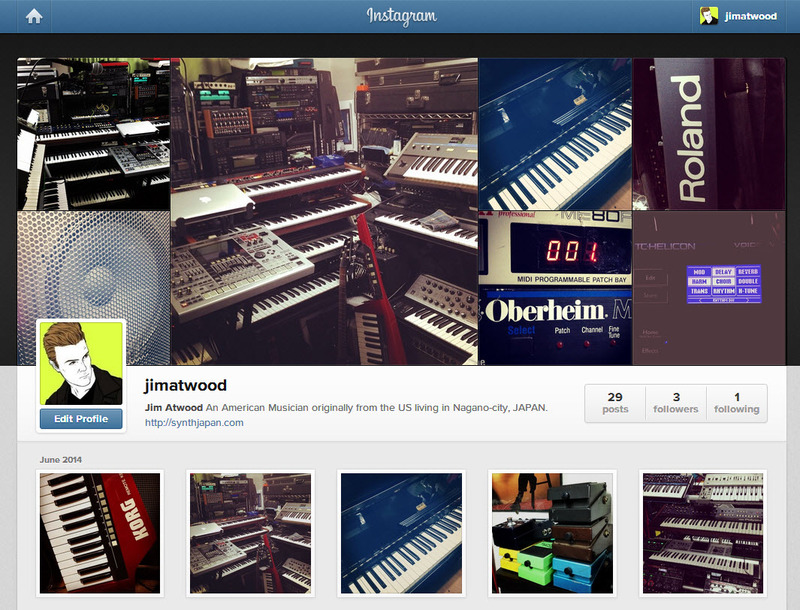 I love that stuff and it totally reminds me of the Korg Polysix that I have and play often. It’s so simple yet works beautifully. I found myself often comparing the System-1 to my recently acquired Novation Bass Station 2. I noticed right away that the filter, although smooth on the System-1, didn’t do as much as I expected like on the older Rolands, Bass Station, and some other vintage analogs I have. That could just be me, but for some reason there wasn’t much instant gratification in working the cutoff and resonance like on other synths. I will say thought that the filter is smooth and does work of course. The envelopes are great and all of the sliders are a joy to use. I didn’t experience any problems and I was shape the sound I wanted easily with them. I also didn’t much like the modulation wheel on the left side. I would have much rather liked a lever/stick or mod wheel found on vintage synths. Again, that might be because I’m used to older gear. The AIRA System-1 mod wheel just didn’t feel natural or easily accessible. It’s there for those that might wonder if a modulation wheel is on the System-1, but it’s personally not that appealing to me. The keys are different as well, being more flat and slightly wider. However, in this case I rather liked the newly styled keys. They didn’t clack or make any unnecessary noise. They were easy to play fast on and they seemed pretty durable. I think this is a definite plus on the System-1. Overall, once I started programming my own patches and kept things simple, I was able to feel more satisfied about my purchase. I should stress that I paid regular price for the AIRA System-1 and could very well just have written an article about justifying my purchase. To keep it real though, I must say that initially I am very underwhelmed by the Roland Aira System-1. It’s growing on me as I work with it, but it’s definitely no analog synth or even close to one at this point. I currently own two Roland SH-101 synths, I really don’t see how that new plugout is going to make that System-1 sound anything like my SH-101 synths. I’m really not convinced yet, but I will say it’s only my thoughts and I could perhaps be pleasantly surprised once the plugouts materialize. We’ll see. Today however, I must say that the Roland AIRA is definitely not worth the money I paid for it. I bought it though and will give it a good run over the next month to see how it goes. I’m on the fence about whether I would recommend it to anyone really. It’s very digital sounding and to me, not in a good way if you are after that analog sound. The AIRA System-1 definitely needs time to be spent programming and trying new things with. That may very well be the most exciting thing to me about the Roland AIRA System-1. I am very anxious about seeing what other people will do with this new addition to the AIRA product line. The Roland AIRA System-1 is fun to work with and also quite challenging if you are trying to get those old analog sounds. There is no issue if you are into the latest EDM sound as that should be quite easy to capture. I know that’s probably who it was made for so I’m not naive about that. I’m just not convinced on Day 1 here that the Roland AIRA System-1 will be able to travel back that far in time. If the Plugouts are good, then the System-1 may very well be worth it. We’ll see. I’ll add more comments as I work more with the System-1. I’m definitely also looking forward to seeing what others do with the System-1 as well. I’m actually expecting a fair number of people to say the Roland AIRA System-1 is great but only to justify their rather expensive purchase…laugh. I should be able to sleep well tonight after my purchase, but it definitely took a couple of hours jamming to feel better about it. Tomorrow will be a new day!! If you have any questions, please let me know and I’ll try to respond asap. Thanks!! 1. All of the sounds are custom programmed patches for the System-1. I’m not using any presets. 2. I am using the Boss RC-300 to loop my drums and the System-1 bass line. 3. NO external effects were used on the System-1. I finally took some shots and uploaded them to my new Instagram account. I have loads of gear shots which I’ll be uploading over the next few months. Stay tuned!